Versatility is the key for new Tennessee Titans head coach Ken Whisenhunt and his coaching staff especially new defensive coordinator Ray Horton. Horton is expected to run a hybrid defense for the Titans with a 3-4 base. The Titans of course have a long history with the 4-3 base defense under former head coach Jeff Fisher. The Titans have focused on 4-3 defensive players in previous draft years but there are some players like Akeem Ayers could make the transition to the 3-4. Last year under former head coach Mike Munchak and his defensive staff they ran some elements of the 3-4 and Ayers played defensive end. Still, the Titans had need of players more familiar with their vision for the defense and Woodyard fits the bill perfectly. At 6′ 0″ and 239 pounds, Woodyard brings a physical presence in addition to experience and versatility. 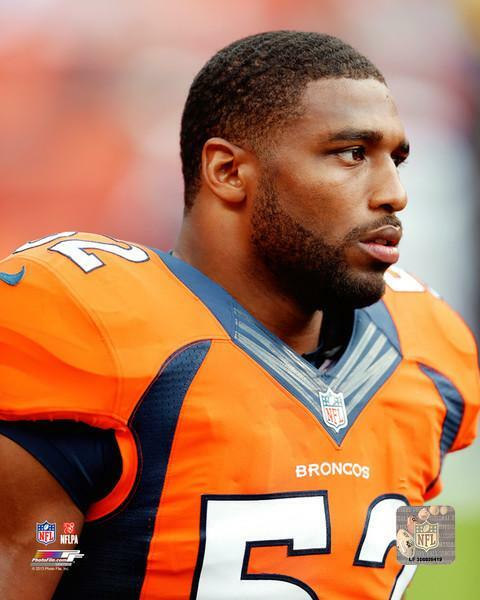 An undrafted free agent who played college ball at Kentucky, Woodyard spent his entire 7 year career with the Denver Broncos. He signed a 4 year $15.75 million dollar contract with $4.75 million guaranteed on March 14, 2014. In his 7 year career, Woodyard has played 87 games, 3361 snaps (going back to 2007) with 434 tackles (300 solo), 8 sacks, 9 quarterback hits, 26 quarterback hurries, 8 forced fumbles with 1 recovery, 5 interceptions, 15 passes defensed, 16 tackles for a loss and 147 defensive stops. Of concern is that he has 29 missed tackles going back to 2007, 10 in and 8 in 2013 alone. Also of somewhat concern are some coverage issues that flare up from time to time. Peyton Manning really ate his lunch back in 2009 when he gave up 3 touchdowns in a 28-16 loss to the Colts. He only gave up 4 touchdowns that year however and the other was to Tom Brady. In his career, he has given up 14 touchdowns including the aforementioned 4 in 2009 and 6 in 2013. While has has played will linebacker as well as left inside linebacker most of those came at the middle linebacker spot. He did give up 1 touchdown at right inside linebacker in 2010 to Phillip Rivers. Quarterbacks who threw touchdown passes against him last year were Joe Flacco, Tom Brady (2), Alex Smith, Matt McGloin, and Russell Wilson. The McGloin touchdown was his second to a Raiders quarterback as he gave up a touchdown to Carson Palmer during the 2011 season. Of note is that he has 2 seasons where he has 3 forced fumbles which is quite excellent including the 2013 season. I wrote how well Shaun Phillips performed in that category and between the two of them that could be a big boost to the defense. He also has some special teams experience so factor that in to his versatility as well. I think it may be too soon to predict whether he will be more a special teamer than a stalwart defensive player as this staff is expected to host open competition on defense. Training camp should be a lot of fun to watch this year as competition should be high. So welcome to the Titans Wesley Woodyard we look forward to watching you do work. 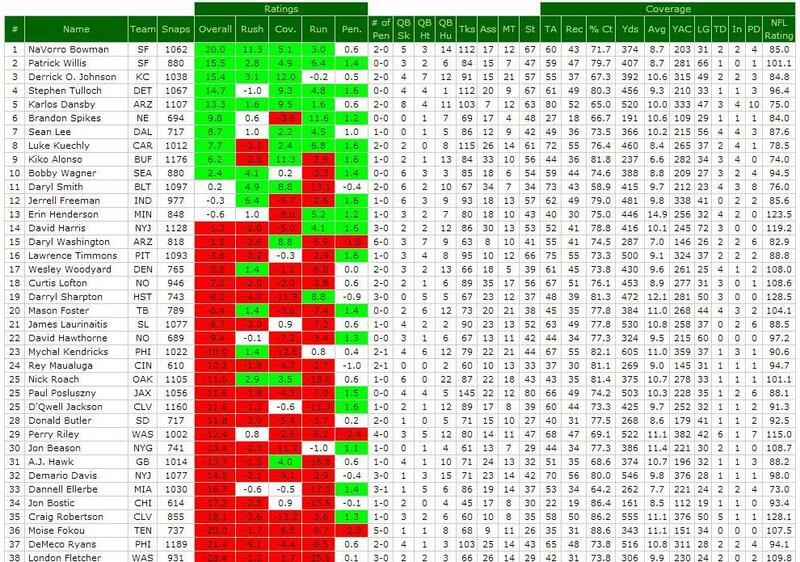 I should add that Woodyard finished the 2013 ranked 17th among all inside linebackers who played at least 75% of the snaps per Pro Football Focus.